Subject does not match any known ad, but would give two tix for BB. Lugs on the above BB in the ad Shawn posted are more like the ones on the 1956 Golden Clipper. I'd agree with Bobbee as the lugs are not an exact match but the dial is what makes me think BB. I will be tentative at best as a Beau Brummell. My first thought was that the number of diamonds or maybe the placement of them might have a bearing but I can't seem to make that correlation. My gut tells me Beau Brumnell, I just can't prove it in a court of law. I'm actually going against the grain on this one and saying it's a Bulova 23. The earliest advert I have found for a 23 jeweled BB is 1957 with most appearing from 1959 onwards. Based on the year alone I'm incline to ID this as a Bulova 23 with unknown variant, but my gut tells me that if we do find a later BB 6 diamond configuration that the variant will be the same. I believe they simply rebadged these diamond versions as BBs post 1955. 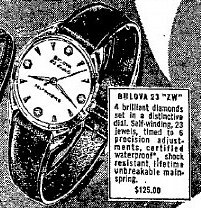 Earliest ad for a diamond dial Bulova "23" is 1958. Earliest round cased BB ad is 1957. I would be most comfortable with it as a "23" as well.